"On the southern coast of England, there's a legend people tell of days long ago when the great Scarecrow would ride from the jaws of hell...and laugh with a fiendish yell"
In 1964, "Dr.Syn: The Scarecrow of Romney Marsh" debuted on The Wonderful World of Color and kiddies all across America and Britain were glued to their television sets to watch the burlap masked avenger of justice ride through Romney Marsh in the dark of night cackling like a banshee. 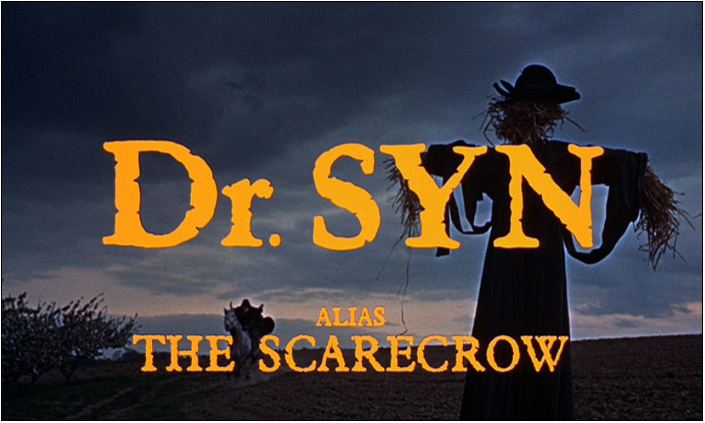 The haunting Scarecrow was a folk-hero to the villagers of the sleepy hamlet. They were being grossly overtaxed by King George III and the menfolk were being shanghaied into naval service by press-gangs until whoosh! out of the night rode a savior - a smuggler in fact - named Scarecrow. Robbing from caravans and merchant ships laden with gold en route to the King, the Scarecrow and his henchmen mercilessly pillared their booty to distribute to the poor folk of the parish of Romney Marsh. Only his closet associates Hellspite and The Curlew knew that Scarecrow was in fact Dr. Christopher Syn ( Patrick McGoohan ), the vicar of the local parish. Unlike Walt Disney's other television series which spanned across twenty or more 1/2 hour episodes, The Scarecrow of Romney Marsh was structured more like a mini-series and aired in three 1 hour parts. 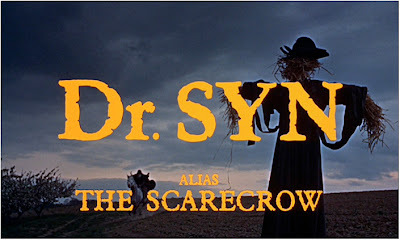 On December 1963 "Dr. Syn, Alias the Scarecrow" a 98 minute feature film version was released in theaters across the pond and here in the States in 1975 ( yes, there was a 12 year delay ). Doctor Syn was originally conceived by Russell Thorndike who wrote the novel on the renegade priest turned pirate in 1915 in a book titled "Dr. Syn: A Tale of Romney Marsh". His character is murdered at the end of this novel but he was resurrected from the dead in 1935 and made the dark hero of in another six books. 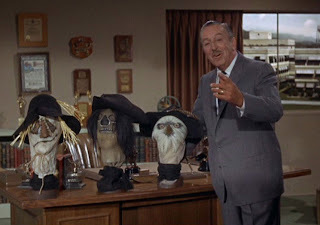 It was the 1960 novel "Christopher Syn" written by American author William Buchanan that caught the eye of Walt Disney who instantly saw its story potential and cleaned it up a bit for his use on his Wonderful World of Color program. Sparing no expense he sent director James Neilson, a camera crew and a top-notch English cast including George Cole, Tony Britton, Kay Walsh, Michael Hordern and Geoffrey Keen to film on location at Romney Marsh, located in the southeast of England in the county of Kent. For years "The Scarecrow of Romney Marsh" has been a very difficult program to come by but recently Walt Disney Studios released a magnificently restored collector's edition to the public apart of the Walt Disney Treasures collection. Chock full of special extras such as a featurette about Dr.syn's origins, an introduction by Leonard Maltin, and the making of the television series, it is a wonderful addition to any collection but alas.....at it's extortionate price it's a DVD not many can afford. "Genevieve" ( 1953 ) starring John Gregson, Dinah Sheridan and Kenneth More. Let's skip introductions..we'll find out more about each other as time goes by. The AFI Catalog of Films - here you can find indepth play-by-play reviews of all major films. The Movie Store - THE place to find beautiful pics!